Studio One Eleven has unveiled renderings for the 2110 Bay Development in Downtown Los Angeles. The 1.8-acre complex consists of three distinct buildings tied together via a mix of public and private open spaces, all sitting atop a three-level subterranean garage in L.A.’s Arts District. The project, located on a site adjacent to the recently-announced SoHo Warehouse private club, will continue the southern momentum catalyzed by that development as the Arts District’s physical boundaries continue to expand toward Interstate-10 block-by-block. 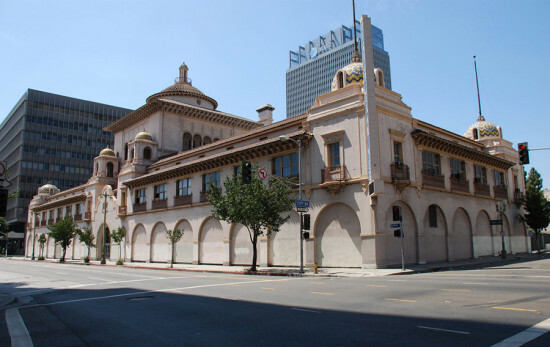 Interstate 10 is widely seen as the far-southern border of Downtown Los Angeles, with a broad expanse of low, industrial buildings and warehouses standing between the previously-observed southern boundary of the Arts District along 7th Street and the freeway. The coffee roaster Stumptown opened a regional production facility and cafe a block south of 7th Street in 2013 and the area has been seeing steady activity since. The announcement late in 2015 of SoHo Warehouse’s arrival immediately codified that southward expansion, rising land values in the area overnight. The 2110 Bay lot was purchased in the heat of the moment by the project’s developer, Bay Capital Fund LLC, in April 2015 for $11 million. The new complex, located directly behind the forthcoming Warehouse, will include an 110-unit “live-work tower” of unspecified height as well as a 100,000 square foot office building and in excess of 50,000 square feet of commercial space. That commercial space will be housed in a repurposed industrial shed structure containing an outdoor mezzanine level. All of the structures will be similarly intertwined with exterior open spaces via exterior circulation and plazas. This includes the rooftops, as two of the structures, the tower and office structure, will host a pool and restaurant, respectively. 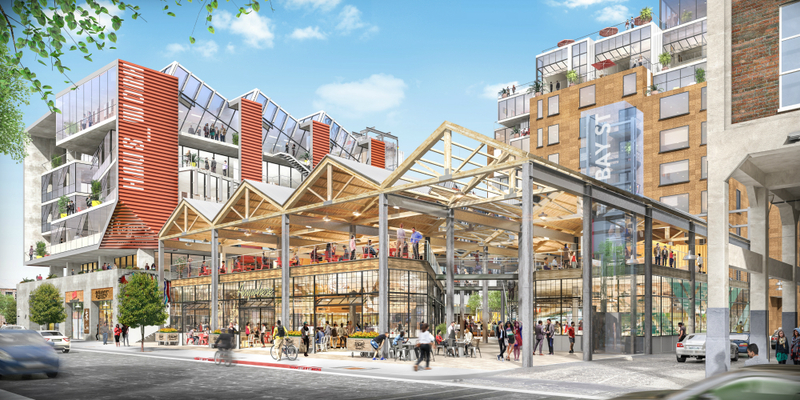 Renderings released by the firm show a bricolage of materials and formal strategies for the complex, with the industrial structure’s sawtooth roof and structural frame acting as an armature for the open-air commercial spaces and mezzanine. That sawtooth form is repeated over one of the apartment buildings while the shed’s industrial materials are complemented by other hard surfaces nearby like the concrete piers of the SoHo Warehouse and what appears to be buff brick and corrugated metal cladding on two of the structures. A construction timeline for the project has not been released. The days of airport as shopping and entertainment destination are in full swing. Construction of the new 40,000 square foot passenger concourse at the Long Beach Municipal Airport (LGB) will be finished next month. And this is no ordinary concourse. As part of a $140 million modernization project, the two-year renovation not only includes waiting and screening areas, but also two new terminals with 10,000 square feet of retail and restaurant space along with 4,200 square feet of outdoor patio seating containing fire pits, cabanas, and outdoor performance areas. Long Beach design firm Studio One Eleven is behind the concessions’ resort-like ambiance. Using natural materials and nautical influences, such as reclaimed wood veneers, coconut shell counters, and Carrera marble, the space emphasizes comfort and connection to the outdoors. Operable glass doors create a seamless patio-to-indoor pavilion. 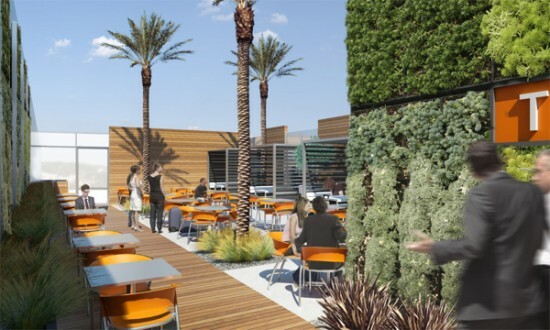 The adjacent food court is set up like an open market where guests can wander through self-serve islands of fresh food or try bites from Long Beach’s top restaurants. And when finished dining, passengers can shop among a slew of local favorites, leaving them wondering if this is an airport at all. Our friend Alissa Walker reports in LA Weekly that San Francisco's Parklet craze (SF now has 23 of the parks built on former parking spaces) has reached the streets of Long Beach. Designed by Studio One Eleven, Southern California's first parklet is a 30-foot-by-7-foot space with wood decking just outside of the city's Lola's Mexican restaurant. Lola's owner, Luis Navarro, paid for the $20,000 parklet, plus the cost of the chairs and tables. 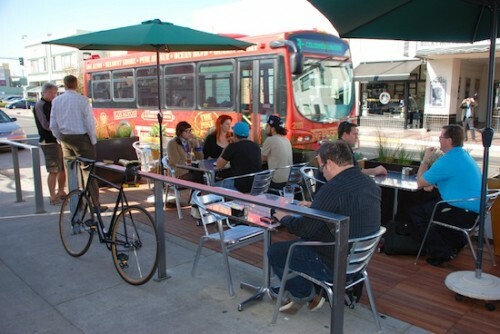 According to the story two more Long Beach parklets will be opening in the next few months—one at a coffee shop and one at a Vietnamese restaurant. Meanwhile LA is on the way to getting its own parklets (hopefully) thanks to the launch of its Parklets Program at the end of last year.